Dalmatian Welfare » Young or Old? You want to adopt a Dalmatian. Do you want a young or mature Dalmatian? We have Dalmatians of all ages in Welfare. Generally we tend to get more males than females, we tend to have more mature Dalmatians than puppies in fact we very rarely get puppies under 6 months old in Welfare. There are advantages and disadvantages to owning dogs of all ages. You should spend some time with you family talk about what you want to do with your dog. Younger dogs tend to be more active than older ones, so a younger dog may be suitable for an active outdoor family. It may be a good idea to try and meet a few adult Dalmatians. Try and spend some time with them maybe accompany their owner on a walk. Our extensive network of British Dalmatian Club volunteers and area representatives can help arrange such a meeting. Are you at work for a few hours every day? Will the dog be left for 3-4 hours? If this is the case then a more mature Dalmatian may be less active in the home, he or she should have passed through the destructive phase and can be safely left for short periods. A younger dog may dislike being left alone and could be destructive or noisy. A mature Dalmatian may suffer from a variety of medical conditions than a younger dog, we will however support medical costs from any existing problems that a dog has when he or she is re-homed. Younger Dalmatians may be more easily trained and bad habits can be turned around more easily than mature dogs. Younger Dalmatians may be more adaptable to new routines and situations. These issues are something you can discuss with your adoption assessor when they visit or with our Central Coordinator. We recommend that you be as flexible with your requirements as you can be, we will be able to re-home a Dalmatian with you more quickly and often the perfect dog for you family may not have been your first choice on paper. 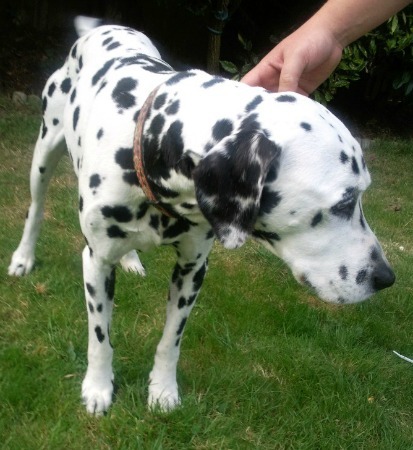 Sadly, occasionally we have very mature Dalmatians needing a new home. Dalmatians of this age make perfect, quiet companions. Most still love a walk and are happy to meet and greet family and friends. We do not ask for a donation for our Golden Oldies over ten years of age and any medical problems these dogs may be suffering from when you adopt them will be paid for by Welfare. There is something so special about an older Dalmatian, do you think you can find a comfy chair or a place near the fire for a senior spotty, who through no fault of his or her own now find themselves alone?